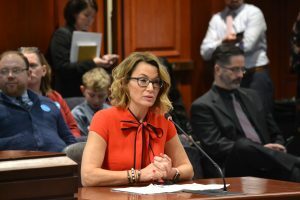 HARTFORD, CT., – House Republican Leader Themis Klarides testifies on House Bill Number 5551: An Act Increasing Penalties for Dealing Synthetic Drugs. This bill is an important House Republican proposal to amend the definition of “narcotic substance” to add fentanyl and fentanyl derivatives. This necessary change will increase the penalties for dealing and manufacturing fentanyl substances. According to the Office of the Chief Medical Examiner, there were 1,033 overdose deaths in Connecticut in 2017. This is a 13% increase from the 917 overdose deaths in 2016, which was already up 26% from 2015. According to the Office of the Chief Medical Examiner, there were ­­677 fentanyl related deaths in 2017 alone. There has been an alarming increase in fentanyl related deaths over the years; with 479 fentanyl related deaths in 2016 and 188 in 2015. Connecticut is in the midst of an opioid epidemic. We have a responsibility as legislators to do all that we can to address this crisis. The House Republican Caucus believes that increasing penalties for the dealing and manufacturing of fentanyl and fentanyl derivatives will not only reduce the use of opioids in Connecticut, but possibly save lives. A substance that is more powerful than heroin should absolutely be included under the definition of a “narcotic substance,” this is a necessary and common sense way to battle the devastating opioid epidemic plaguing Connecticut. On March 18, 2015, the United States Drug Enforcement Agency (DEA) issued a nationwide alert about the dangers of fentanyl stating “often laced in heroin, fentanyl, and fentanyl analogues produced in illicit clandestine labs are up to 100 times more powerful than morphine and 30-50 times more powerful than heroin.” The DEA warns that fentanyl is the most potent opioid available for use in medical treatment and is potentially lethal. Now, according to reports there is a new drug that is a fentanyl derivative called furanyl fentanyl which is even more potent and dangerous.